We know that Miami has beaches, great weather (most of the time) and its a great place to call home. But did you know that its also one of the sweatiest cities around? We ranked number 4 behind Chicago (3), Washington D.C. (2), New York (1). But don’t get hot under the collar about it. Hot weather and heat can be tolerated if you happen to live in Miami. And there are many communities within close proximity to the sun and fun. And one of the most sought after is the island of Key Biscayne. This may be the just the address you are looking for. 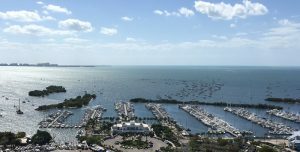 About 12,000 residents live year round and take advantage of its many amenities: there are endless bike lanes, pristine beaches, water sports everywhere you look, and a great tennis club. And although its a busy location it still has a small town feel. Don’t forget with 67 square miles of beaches and waterways, a short or long dip is always within reach. 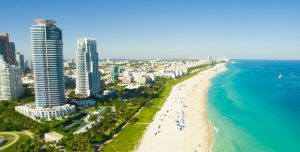 Maybe that’s why we were voted America’s #3 fun city and the country’s cleanest city to live in according to Forbes Magazine…Miami certainly has flourished! within the last decade every neighborhood has grown, and with that comes a long list of offerings, including new restaurants, movie theatres, galleries and museums. Even more encouraging is the fact that quite a number of us are leaving our cars behind and leisurely walking to our destinations. We are one of the top 5 cities in the U.S. whose residents prefer to walk and enjoy their surroundings. And our downtown area is an example of the many possibilities available to young and old. Here you’ll have a taste of city life with ocean breezes, and best of all almost everything is within walking distance. Now if we could only get rid of that nuisance also referred to as mosquitos we’ve be even happier and have more reasons to go outdoors. Its not only downtown that has as many cars as pedestrians, some of our most sought after neighborhoods like Coral Gables and South Miami are beginning to listen to their residents desires to break the car habit and stroll through their streets. They are opening new streets for pedestrians only. Yet in case you get tired after a long day of window shopping, gallery hopping or a great meal don’t fret if you realize all your energy is gone. There is always a trolly near by to take you to your next destination. And with all these great temptations, there is no distance too great to walk to.